Utagawa Kuniyoshi (1797-1861) The Hundred Poets Part One #70: The Monk Ryosen, 1840 - 42. Oban. Kuniyoshi landscapes are very rare. He frequently collaborated with other artists, notably Hiroshige, when landscape elements were required. 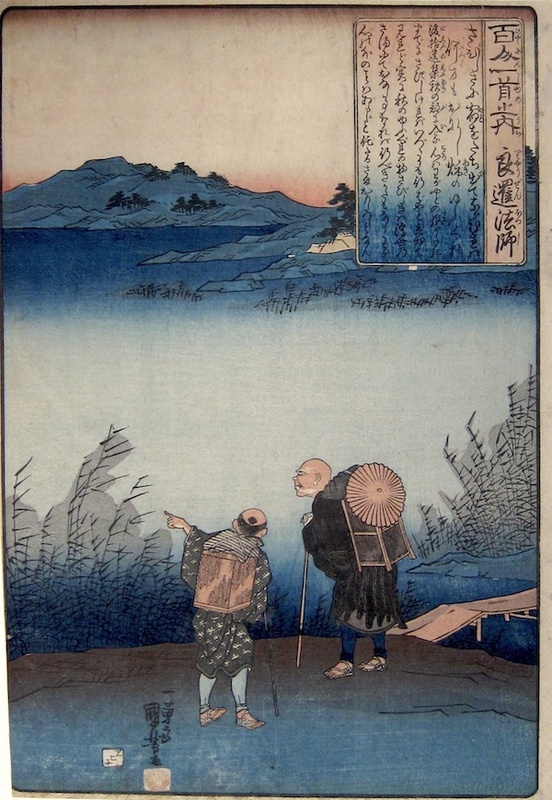 This print owes a debt to Hiroshige in its portrayal of the calm, evening lake and hills beyond. The subject is the poet and monk Ryosen from the series One Hundred Poets, published from 1840 by Ebisu. I leave my little hut. <="" i="">The print is a good impression, the colour is fine and the condition very good - some scuffing to the lower edge and minor marks. Nearly full size with margins, margin trimmed bottom left edge. Signed Ichiyusai Kuniyoshi ga, published by Ebisu.